For other uses, see Pharaoh (disambiguation). The Pschent combined the Red Crown of Lower Egypt and the White Crown of Upper Egypt. A typical depiction of a pharaoh. After Djoser of the Third Dynasty, pharaohs were usually depicted wearing the nemes headdress, a false beard, and an ornate kilt. Pharaoh (/ˈfɛəroʊ/, US also /ˈfeɪ.roʊ/; Coptic: ⲡⲣ̅ⲣⲟ Pǝrro) is the common title of the monarchs of ancient Egypt from the First Dynasty (c. 3150 BCE) until the annexation of Egypt by the Roman Empire in 30 BCE, although the actual term "Pharaoh" was not used contemporaneously for a ruler until Merneptah, c. 1200 BCE. In the early dynasty, ancient Egyptian kings used to have up to three titles, the Horus, the Sedge and Bee (nswt-bjtj) name, and the Two Ladies (nbtj) name. The Golden Horus and nomen and prenomen titles were later added. In Egyptian society, religion was central to everyday life. One of the roles of the pharaoh was as an intermediary between the gods and the people. The pharaoh thus deputised for the gods; his role was both as civil and religious administrator. He owned all of the land in Egypt, enacted laws, collected taxes, and defended Egypt from invaders as the commander-in-chief of the army. Religiously, the pharaoh officiated over religious ceremonies and chose the sites of new temples. He was responsible for maintaining Maat (mꜣꜥt), or cosmic order, balance, and justice, and part of this included going to war when necessary to defend the country or attacking others when it was believed that this would contribute to Maat, such as to obtain resources. During the early days prior to the unification of Upper and Lower Egypt, the Deshret or the "Red Crown", was a representation of the kingdom of Lower Egypt, while the Hedjet, the "White Crown", was worn by the kings of the kingdom of Upper Egypt. After the unification of both kingdoms into one united Egypt, the Pschent, the combination of both the red and white crowns was the official crown of kings. With time new headdresses were introduced during different dynasties like the Khat, Nemes, Atef, Hemhem crown, and Khepresh. At times, it was depicted that a combination of these headdresses or crowns would be worn together. The word pharaoh ultimately derives from the Egyptian compound pr ꜥꜣ, /ˌpaɾuwˈʕaʀ/ "great house", written with the two biliteral hieroglyphs pr "house" and ꜥꜣ "column", here meaning "great" or "high". It was used only in larger phrases such as smr pr-ꜥꜣ "Courtier of the High House", with specific reference to the buildings of the court or palace. From the Twelfth Dynasty onward, the word appears in a wish formula "Great House, May it Live, Prosper, and be in Health", but again only with reference to the royal palace and not the person. Sometime during the era of the New Kingdom, Second Intermediate Period, pharaoh became the form of address for a person who was king. The earliest confirmed instance where pr ꜥꜣ is used specifically to address the ruler is in a letter to Akhenaten (reigned c. 1353–1336 BCE) which is addressed to "Great House, L, W, H, the Lord". However, there is a possibility that the title pr ꜥꜣ was applied to Thutmose III (c. 1479–1425 BCE), depending on whether an inscription on the Temple of Armant can be confirmed to refer to that king. During the Eighteenth Dynasty (16th to 14th centuries BCE) the title pharaoh was employed as a reverential designation of the ruler. About the late Twenty-first Dynasty (10th century BCE), however, instead of being used alone as before, it began to be added to the other titles before the ruler's name, and from the Twenty-Fifth Dynasty (eighth to seventh centuries BCE) it was, at least in ordinary usage, the only epithet prefixed to the royal appellative. From the nineteenth dynasty onward pr-ꜥꜣ on its own was used as regularly as ḥm, "Majesty". [note 1] The term, therefore, evolved from a word specifically referring to a building to a respectful designation for the ruler, particularly by the Twenty-Second Dynasty and Twenty-third Dynasty. For instance, the first dated appearance of the title pharaoh being attached to a ruler's name occurs in Year 17 of Siamun on a fragment from the Karnak Priestly Annals. Here, an induction of an individual to the Amun priesthood is dated specifically to the reign of Pharaoh Siamun. This new practice was continued under his successor Psusennes II and the Twenty-second Dynasty kings. For instance, the Large Dakhla stela is specifically dated to Year 5 of king "Pharaoh Shoshenq, beloved of Amun", whom all Egyptologists concur was Shoshenq I—the founder of the Twenty-second Dynasty—including Alan Gardiner in his original 1933 publication of this stela. Shoshenq I was the second successor of Siamun. Meanwhile, the old custom of referring to the sovereign simply as pr-ˤ3 continued in traditional Egyptian narratives. By this time, the Late Egyptian word is reconstructed to have been pronounced *[parʕoʔ] whence Herodotus derived the name of one of the Egyptian kings, Koinē Greek: Φερων. In the Hebrew Bible, the title also occurs as Hebrew: פרעה‎ [parʕoːh]; from that, in the Septuagint, Koinē Greek: φαραώ, translit. pharaō, and then in Late Latin pharaō, both -n stem nouns. The Qur'an likewise spells it Arabic: فرعون‎ firʿawn with n (here, always referring to the one evil king in the Book of Exodus story, by contrast to the good king Aziz in surah Yusuf's story). The Arabic combines the original ayin from Egyptian along with the -n ending from Greek. In English, it was at first spelled "Pharao", but the translators of the King James Bible revived "Pharaoh" with "h" from the Hebrew. Meanwhile, in Egypt itself, *[par-ʕoʔ] evolved into Sahidic Coptic ⲡⲣ̅ⲣⲟ pərro and then ərro by mistaking p- as the definite article "the" (from ancient Egyptian pꜣ). Other notable epithets are nswt, translated to "king"; jty for "monarch or sovereign"; nb for "lord";[note 2] and ḥqꜣ for "ruler". Beaded scepter of Khasekhemwy (Museum of Fine Arts in Boston). Sceptres and staves were a general sign of authority in ancient Egypt. One of the earliest royal scepters was discovered in the tomb of Khasekhemwy in Abydos. 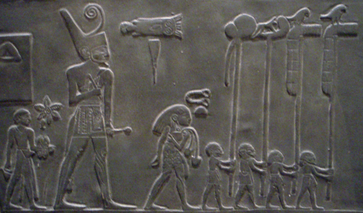 Kings were also known to carry a staff, and Pharaoh Anedjib is shown on stone vessels carrying a so-called mks-staff. The scepter with the longest history seems to be the heqa-sceptre, sometimes described as the shepherd's crook. The earliest examples of this piece of regalia dates to prehistoric Egypt. A scepter was found in a tomb at Abydos that dates to Naqada III. Another scepter associated with the king is the was-sceptre. This is a long staff mounted with an animal head. The earliest known depictions of the was-scepter date to the First Dynasty. The was-scepter is shown in the hands of both kings and deities. The flail later was closely related to the heqa-scepter (the crook and flail), but in early representations the king was also depicted solely with the flail, as shown in a late pre-dynastic knife handle which is now in the Metropolitan museum, and on the Narmer Macehead. The earliest evidence known of the Uraeus—a rearing cobra—is from the reign of Den from the First Dynasty. The cobra supposedly protected the pharaoh by spitting fire at its enemies. The red crown of Lower Egypt, the Deshret crown, dates back to pre-dynastic times and symbolised chief ruler. 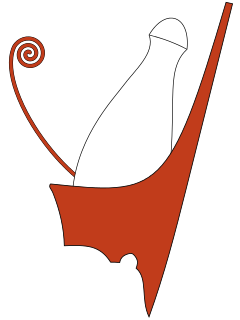 A red crown has been found on a pottery shard from Naqada, and later, Narmer is shown wearing the red crown on both the Narmer Macehead and the Narmer Palette. The white crown of Upper Egypt, the Hedjet, was worn in the Predynastic Period by Scorpion II, and, later, by Narmer. This is the combination of the Deshret and Hedjet crowns into a double crown, called the Pschent crown. It is first documented in the middle of the first dynasty. The earliest depiction may date to the reign of Djet, and is otherwise surely attested during the reign of Den. The khat headdress consists of a kind of "kerchief" whose end is tied similarly to a ponytail. The earliest depictions of the khat headdress comes from the reign of Den, but is not found again until the reign of Djoser. The Nemes headdress dates from the time of Djoser. It is the most common type of crown that has been depicted throughout Pharaonic Egypt. Any other type of crown, apart from the Khat headdress, has been commonly depicted on top of the Nemes. The statue from his Serdab in Saqqara shows the king wearing the nemes headdress. Osiris is shown to wear the Atef crown, which is an elaborate Hedjet with feathers and disks. Depictions of Pharaohs wearing the Atef crown originate from the Old Kingdom. The Hemhem crown is usually depicted on top of Nemes, Pschent, or Deshret crowns. It is an ornate triple Atef with corkscrew sheep horns and usually two uraei. The usage (depiction) of this crown begins during the Early 18th dynasty of Egypt. Also called the blue crown, the Khepresh crown has been depicted in art since the New Kingdom. It is often depicted being worn in battle, but it was also frequently worn during ceremonies. It used to be called a war crown by many, but modern historians refrain from defining it thus. Egyptologist Bob Brier has noted that despite their widespread depiction in royal portraits, no ancient Egyptian crown has ever been discovered. Tutankhamun's tomb, discovered largely intact, did contain such regalia as his crook and flail, but no crown was found among the funerary equipment. Diadems have been discovered. It is presumed that crowns would have been believed to have magical properties. Brier's speculation is that crowns were religious or state items, so a dead pharaoh likely could not retain a crown as a personal possession. The crowns may have been passed along to the successor. During the early dynastic period kings had three titles. The Horus name is the oldest and dates to the late pre-dynastic period. The Nesu Bity name was added during the first dynasty. The Nebty name was first introduced toward the end of the first dynasty. The Golden falcon (bik-nbw) name is not well understood. The prenomen and nomen were introduced later and are traditionally enclosed in a cartouche. By the Middle Kingdom, the official titulary of the ruler consisted of five names; Horus, nebty, golden Horus, nomen, and prenomen for some rulers, only one or two of them may be known. The Nesu Bity name, also known as Prenomen, was one of the new developments from the reign of Den. The name would follow the glyphs for the "Sedge and the Bee". The title is usually translated as king of Upper and Lower Egypt. The nsw bity name may have been the birth name of the king. It was often the name by which kings were recorded in the later annals and king lists. The Horus name was adopted by the king, when taking the throne. The name was written within a square frame representing the palace, named a serekh. The earliest known example of a serekh dates to the reign of king Ka, before the first dynasty. The Horus name of several early kings expresses a relationship with Horus. Aha refers to "Horus the fighter", Djer refers to "Horus the strong", etc. Later kings express ideals of kingship in their Horus names. Khasekhemwy refers to "Horus: the two powers are at peace", while Nebra refers to "Horus, Lord of the Sun". The earliest example of a nebty name comes from the reign of king Aha from the first dynasty. The title links the king with the goddesses of Upper and Lower Egypt Nekhbet and Wadjet. The title is preceded by the vulture (Nekhbet) and the cobra (Wadjet) standing on a basket (the neb sign). The Golden Horus or Golden Falcon name was preceded by a falcon on a gold or nbw sign. The title may have represented the divine status of the king. The Horus associated with gold may be referring to the idea that the bodies of the deities were made of gold and the pyramids and obelisks are representations of (golden) sun-rays. The gold sign may also be a reference to Nubt, the city of Set. This would suggest that the iconography represents Horus conquering Set. The prenomen and nomen were contained in a cartouche. The prenomen often followed the King of Upper and Lower Egypt (nsw bity) or Lord of the Two Lands (nebtawy) title. The prenomen often incorporated the name of Re. The nomen often followed the title Son of Re (sa-ra) or the title Lord of Appearances (neb-kha). ^ The Bible refers to Egypt as the "Land of Ham". ^ nb.f means "his lord", the monarchs were introduced with (.f) for his, (.k) for your. ^ Clayton, Peter A. Chronicle of the Pharaohs the Reign-by-reign Record of the Rulers and Dynasties of Ancient Egypt. London: Thames & Hudson, 2012. Print. ^ "Pharaoh". AncientEgypt.co.uk. The British Museum. 1999. Retrieved 20 December 2017. ^ Mark, Joshua (2 September 2009). "Pharaoh - Ancient History Encyclopedia". ancient.eu. Ancient History Encyclopedia Limited. Retrieved 20 December 2017. ^ A. Gardiner, Ancient Egyptian Grammar (3rd edn, 1957), 71–76. ^ Hieratic Papyrus from Kahun and Gurob, F. LL. Griffith, 38, 17. ^ Petrie, W. M. (William Matthew Flinders); Sayce, A. H. (Archibald Henry); Griffith, F. Ll (Francis Llewellyn) (1891). Illahun, Kahun and Gurob : 1889-1890. Cornell University Library. London : D. Nutt. p. 50. ^ Robert Mond and O.H. Meyers. Temples of Armant, a Preliminary Survey: The Text, The Egypt Exploration Society, London, 1940, 160. ^ "pharaoh" in Encyclopædia Britannica. Ultimate Reference Suite. Chicago: Encyclopædia Britannica, 2008. ^ a b c Doxey, Denise M. (1998). Egyptian Non-Royal Epithets in the Middle Kingdom: A Social and Historical Analysis. BRILL. p. 119. ISBN 90-04-11077-1. ^ J-M. Kruchten, Les annales des pretres de Karnak (OLA 32), 1989, pp. 474–478. ^ Alan Gardiner, "The Dakhleh Stela", Journal of Egyptian Archaeology, Vol. 19, No. 1/2 (May, 1933) pp. 193–200. ^ Herodotus, Histories 2.111.1. See Anne Burton (1972). Diodorus Siculus, Book 1: A Commentary. Brill. , commenting on ch. 59.1. ^ Elazar Ari Lipinski: "Pesach – A holiday of questions. About the Haggadah-Commentary Zevach Pesach of Rabbi Isaak Abarbanel (1437–1508). Explaining the meaning of the name Pharaoh." Published first in German in the official quarterly of the Organization of the Jewish Communities of Bavaria: Jüdisches Leben in Bayern. Mitteilungsblatt des Landesverbandes der Israelitischen Kultusgemeinden in Bayern. Pessach-Ausgabe Nr. 109, 2009, ZDB-ID 2077457-6, S. 3–4. ^ Walter C. Till: "Koptische Grammatik". VEB Verläg Enzyklopädie, Leipzig, 1961. p. 62. ^ a b Wilkinson, Toby A.H. Early Dynastic Egypt. Routledge, 2001, p. 158. ^ Wilkinson, Toby A.H. Early Dynastic Egypt. Routledge, 2001, p. 159. ^ a b Wilkinson, Toby A.H. Early Dynastic Egypt. Routledge, 2001, p. 160. ^ Wilkinson, Toby A.H. Early Dynastic Egypt. Routledge, 2001, p. 161. ^ Wilkinson, Toby A.H. Early Dynastic Egypt. Routledge, 2001, p. 162. ^ Shaw, Garry J. The Pharaoh, Life at Court and on Campaign. Thames and Hudson, 2012, pp. 21, 77. ^ Bob Brier, The Murder of Tutankhamen, 1998, p. 95. ^ Toby A. H. Wilkinson, Early Dynastic Egypt, Routledge 1999, pp. 57f. Shaw, Garry J. The Pharaoh, Life at Court and on Campaign, Thames and Hudson, 2012. Sir Alan Gardiner Egyptian Grammar: Being an Introduction to the Study of Hieroglyphs, Third Edition, Revised. London: Oxford University Press, 1964. Excursus A, pp. 71–76. Jan Assmann, "Der Mythos des Gottkönigs im Alten Ägypten," in Christine Schmitz und Anja Bettenworth (hg. ), Menschen - Heros - Gott: Weltentwürfe und Lebensmodelle im Mythos der Vormoderne (Stuttgart, Franz Steiner Verlag, 2009), pp. 11–26. Wikivoyage has a travel guide for Pharaohs. Narmer was an ancient Egyptian king of the Early Dynastic Period, circa 3100-3050 BC. He probably was the successor to the Protodynastic king Ka, or possibly Scorpion. Some consider him the unifier of Egypt and founder of the First Dynasty, and in turn the first king of a unified Egypt. The Palermo Stone is one of seven surviving fragments of a stele known as the Royal Annals of the Old Kingdom of Ancient Egypt. The stele contained a list of the kings of Egypt from the First Dynasty through to the early part of the Fifth Dynasty and noted significant events in each year of their reigns. It was probably made during the Fifth dynasty. The Palermo Stone is held in the Regional Archeological Museum Antonio Salinas in the city of Palermo, Italy, from which it derives its name. The Uraeus is the stylized, upright form of an Egyptian cobra, used as a symbol of sovereignty, royalty, deity and divine authority in ancient Egypt. Djet, also known as Wadj, Zet, and Uadji, was the fourth pharaoh of the First Dynasty. Djet's Horus name means "Horus Cobra" or "Serpent of Horus". Den, also known as Hor-Den, Dewen and Udimu, is the Horus name of a pharaoh of the Early Dynastic Period who ruled during the First Dynasty of Egypt. He is the best archaeologically-attested ruler of this period. Den is said to have brought prosperity to his realm and numerous innovations are attributed to his reign. 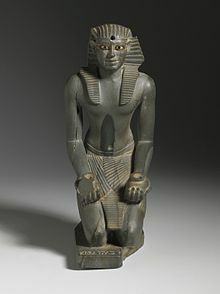 He was the first to use the title "King of Lower and Upper Egypt", and the first depicted as wearing the double crown. The floor of his tomb at Umm El Qa'ab near Abydos is made of red and black granite, the first time in Egypt this hard stone was used as a building material. During his long reign he established many of the patterns of court ritual and royalty used by later rulers and he was held in high regard by his immediate successors. Scorpion II, also known as King Scorpion, refers to the second of two kings or chieftains of that name during the Protodynastic Period of Upper Egypt. Merneith was a consort and a regent of Ancient Egypt during the First Dynasty. She may have been a ruler of Egypt in her own right, based on several official records. If this was the case, she may have been the first female pharaoh and the earliest queen regnant in recorded history. Her rule occurred around 2950 BC for an undetermined period. Merneith’s name means "Beloved by Neith" and her stele contains symbols of that ancient Egyptian deity. She may have been Djer's daughter and was probably Djet's senior royal wife. The former meant that she would have been the great-granddaughter of unified Egypt's first pharaoh, Narmer. She was also the mother of Den, her successor. The Pschent was the double crown worn by rulers in ancient Egypt. The ancient Egyptians generally referred to it as sekhemty (sḫm.ty), the Two Powerful Ones. It combined the Red Deshret Crown of Lower Egypt and the White Hedjet Crown of Upper Egypt. Deshret, from Ancient Egyptian, was the formal name for the Red Crown of Lower Egypt and for the desert Red Land on either side of Kemet, the fertile Nile river basin. When combined with the Hedjet of Upper Egypt, it forms the Pschent, in Ancient Egyptian called the sekhemti. Hedjet is the formal name for the white crown of pharaonic Upper Egypt. After the unification of Upper and Lower Egypt, it was combined with the deshret, the red crown of Lower Egypt, to form the pschent, the double crown of Egypt. The symbol sometimes used for the white crown was the vulture goddess Nekhbet shown next to the head of the cobra goddess Wadjet, the uraeus on the pschent. Ka, also (alternatively) Sekhen, was a Predynastic pharaoh of Upper Egypt belonging to Dynasty 0. He probably reigned during the first half of the 32nd century BCE. The length of his reign is unknown. Neithhotep or Neith-hotep was an ancient Egyptian queen consort living and ruling during the early First Dynasty. She was once thought to be a male ruler: her outstandingly large mastaba and the royal serekh surrounding her name on several seal impressions previously led Egyptologists and historians to the erroneous belief that she may have been an unknown king. The Nebty name was one of the "great five names" used by Egyptian pharaohs. It was also one of the eldest royal titles. The modern term "Two-Ladies-name" is a simple derivation from the translation of the Egyptian word nebty. The prenomen, cartouche name or throne name of ancient Egypt was one of the five royal names of pharaohs. The first pharaoh to have a Sedge and Bee name was Den during the First Dynasty. The nomen of Ancient Egyptian pharaohs was one of the "Great five names". It was introduced by king Djedefre, third pharaoh of the 4th Dynasty, as an emendation to the traditional nswt-bity crest. The nomen was later separated from the prenomen to become an independent royal name.